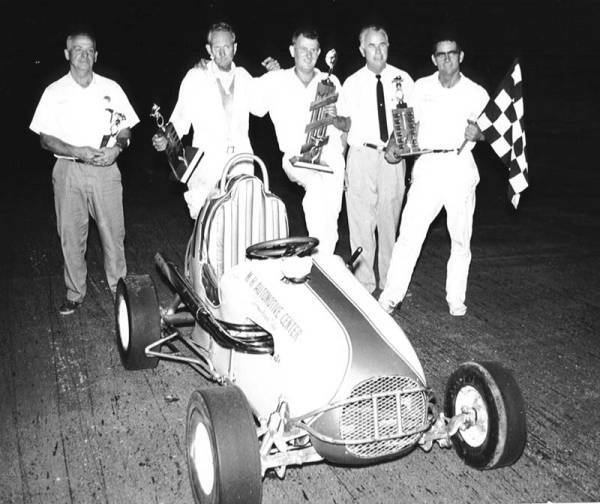 SFRA CHAMPION IN 1960, 1961, 1962, 1964 AND 1965. 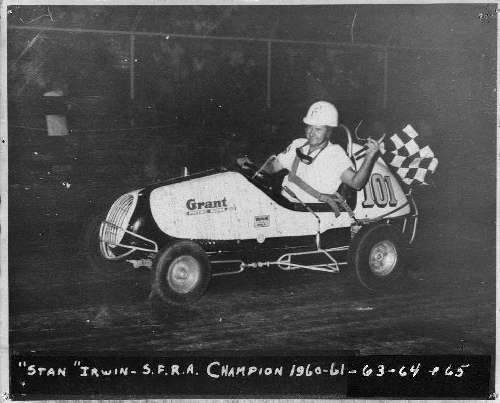 Before we get started, here is a word or two about Stan Irwin. Although he and I never met, I have had long conversations about him with his daughter Dale. She says that her father was a very meticulous man in everything he did. His racing success demonstrates that, but a small part of his racing legacy must be the wonderful collection of newspaper articles that he organized in his scrapbook! 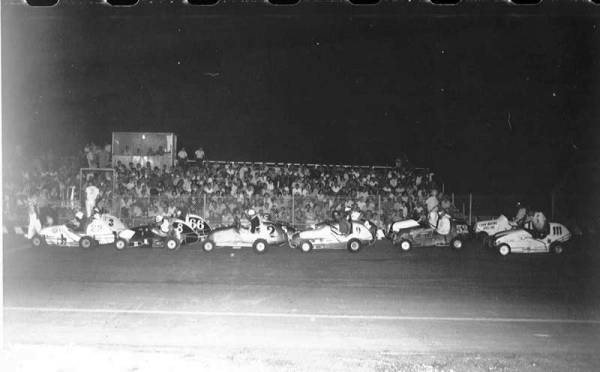 They provide a detailed history of the action, business and politics of the speedway's first year, 1964. The challenge for me is how to present them in a useful way because scanned newspaper articles are difficult to read. I may have to retype them. However, I have made an Excell spreadsheet, based on the news articles, that sumarizes the 1964 race results! This is a work in progress, but click HERE for the latest version! Yep, "Eyeball" Irwin has got to be about the coolest racing nick-name going. So how did he get it? According to his daughter, Stan was racing motorcycles in California during the 1940's. After some sort of skirmish on the track, Stan was riding through the pits when on-lookers screamed and pointed at him in horror. It turns out that one of Stan's eyes had left its socket and was hanging by the nerves. When this was pointed out to Stan, he calmly popped the eye back in place, and a racing handle was born. I've heard a similar story about another racing friend who was in a car accident, so it must be true. Gross, but true! 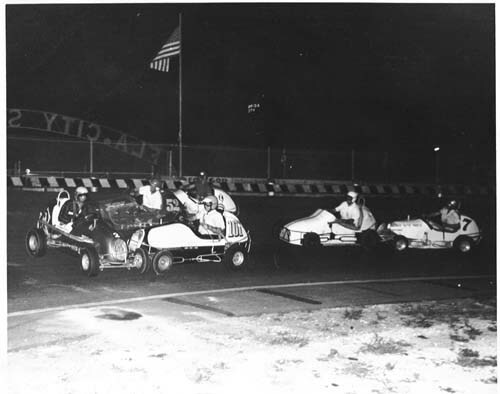 Since there is a 1964 driver roster on the spreadsheet, we should all be experts in identifying these drivers. To me, this looks like Gene Lanham on the pole, Gibbie DeLuce and Jessie Young in row two, Al Brooks and Jack Colby in row three with Brady Mason starting shot-gun on the field. I can't identify the other front row starter. 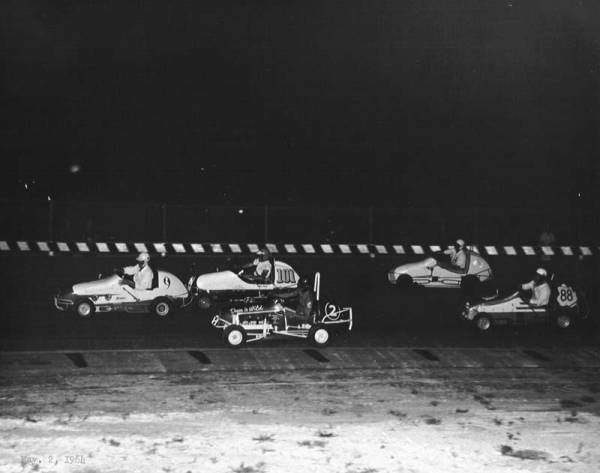 They are racing in open-faced helmets, short sleeves, no gloves and no roll bars. It is amazing any of them lived through it! Opening night action! Ron Paquin in the 4 gets a shove from Gene Lanham in the wild duece. The 9 is either Stan Diehl or Frank Suits. 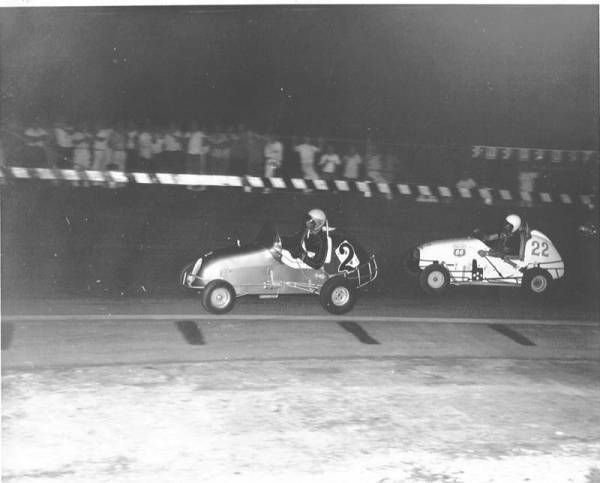 The #6 was a Saab powered roadster driven by Rich Benn, and Lawrence Westbury drove the #5. Another shot from opening night: John Maltz in the 96 leads the Flying Eyeball. Stan was a 20 veteran racer by the time FCS opened. 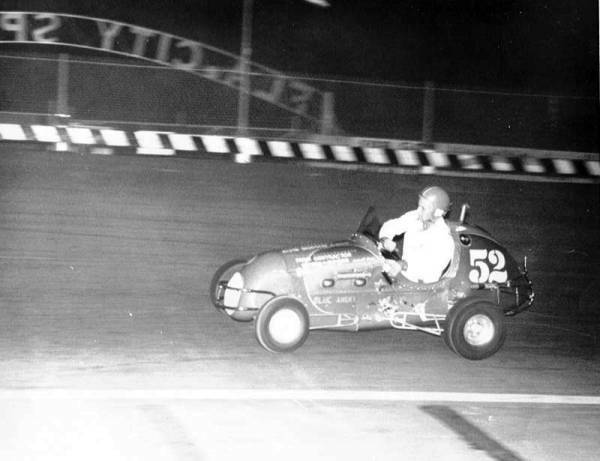 He found much success on the track at the Homestead Rodeo Grounds in the early 1960's. 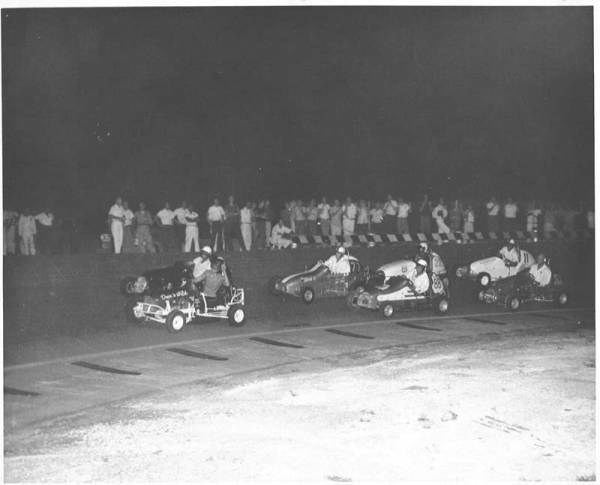 In tight formation behind the #9 of Frank Suits are Stan in his 101, Gene Lanham in the 2, Gibbie DeLuce, #88 and a car that I believe is the 45 of Jay "Pop" Mericle. Gene Lanham and Jack Colby. Amazingly, Gene actually has a racing suit on! Al Brooks. Visit his page by clicking HERE. Remember, it is a contact sport. 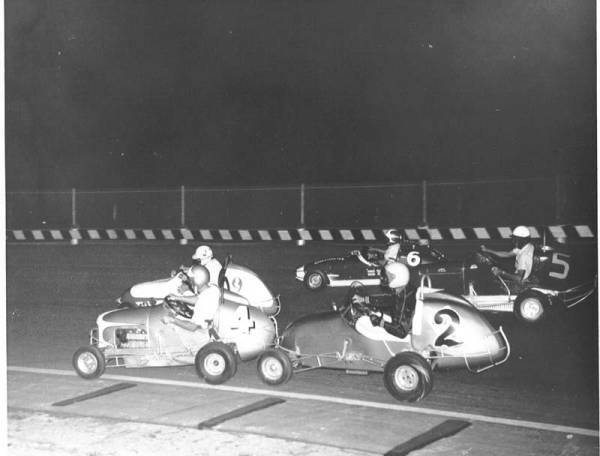 Gene Lanham gets t-boned by Stan as Al Brooks and Frank Suits excape to the high side. 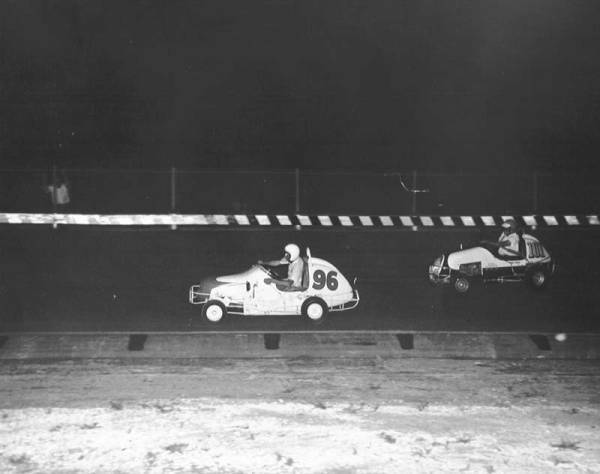 I believe that is Jay Mericle in the white car getting a push from Kenny Andrews. Here are the winners from opening night! From left to right: Jay Mericle, Stan Deihl, James Purslow (?) and main event winner Brady Mason.